I have been printing a lot of parts for various 2D and 3D bots. I have found pieces and parts online and am designing others myself. 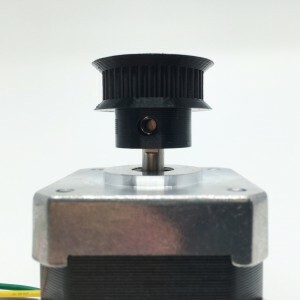 For pulleys and gears that mount to stepper motors, there needs to be a set screw to ensure the pulley/gear stays fixed in place on the rotating shaft of the stepper motor. One set screw technique is to tap or carve threads into the printed plastic part, but the plastic threads can only support so much pressure and will likely eventually become stripped. A better approach is to design a part to have an embedded cavity to hold a metal nut. The set screw then threads through this embedded metal nut and provides pressure to hold the pully/gear in place. This technique of embedding a nut in your printed piece is commonly referred to as a “captive nut”. If you consider embedding other things in 3D prints, all sorts of possibilities start to emerge. Large and complex designs can be broken into smaller pieces that are screwed/bolted together. And electronics, such as LEDs, can be embedded directly inside prints. However, this will be a very iterative process where you design, then print, then design, then print over and over until your piece is complete. 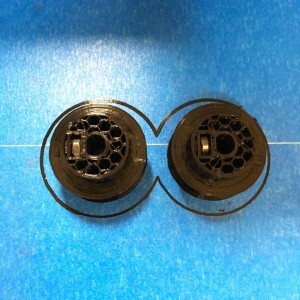 Keep in mind that embeding objects into 3D prints is not just something you can do when designing your own parts from scratch, this is something that you can also do to augment an existing 3D object that you download from the Internet. Back to my stepper motor gear as an example…I decided I wanted to use an M3 (3mm metric) screw and for the set screw. As a result, a M3 nut will be required to be embedded. The above picture illustrates how a set screw tightens perpendicular to the stepper motor shaft. The first step is to measure all dimensions of the M3 nut. Although measurements are available online, I always measure my object to embed in case it is different. If you don’t have digital calipers, you need to get one and I’d recommend watching for a sales at Harbor Freight where you can them for as little as $12 USD. I measured 5.44mm across the flats (F), 6.18mm across the corners (G) and 2.24mm for its width (H). 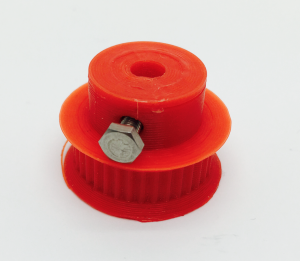 Assuming your printer is calibrated perfectly, you will print parts that are the exact dimension as you have designed. Well, that is true for rectangular parts where there are just straight angles, but that is not true for circular details. This is because a circle is really made up of many points. The more points that are used to define the circle, the more accurate the curve will be. 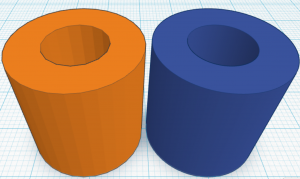 To illustrate how circles are modeled for 3D printing, see the image below of two cylinders modeled in Tinkercad. The orange cylinder is modeled using approximately 20 points to define the circle of the object. In contrast, the blue cylinder is modeled to use 100 points to define the circle of the object. Notice how well refined the blue circle appears vs the orange object. But the more important point is that, although both cylinders were designed with a 10mm hole, the blue hole is larger and closer to 10mm than the orange hole. 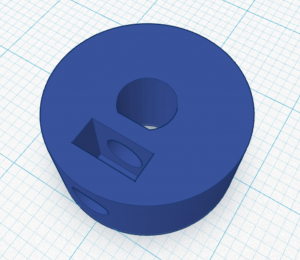 Both objects will have a final printed hold smaller than 10mm, but the blue will be much closer to the desired diameter. The takeaway is to always design circular details with as many points (or dimensions in Tinkercad lingo) as possible. Note in Tinkercad, you have to use a community defined cylinder that allows the number of dimensions to be set. So, by definition, a circle is always smaller 3D printed than it was designed to be. So you always need to make sure your holes are oversized in your design to have the right finished print size. Aside from adjusting for circles, we also need to provide some wiggle room to make sure we can fit our part inside the printed cavity. Based on experience, and knowing some wiggle room is okay (I just cannot have so much wiggle room that my nut is able to spin while embedded), I decided to add about .4mm to the width (F) and height (G) and about .2mm to the depth (H). This resulted in the following dimensions for my cavity for my M3 nut: 5.8mm width (F), 6.6mm height (G) and 2.6mm depth (H). Prior to printing, you need to slice your object and then examine the layers to identify when your printed cavity is fully printed, but no layers are yet printed on top of this cavity. This is the place where you need to pause your print, insert your nut, and resume your print. Most 3D printing software allows a print to be paused, and allows your print head to be jogged (in case it is blocking your cavity). Most software, including Simplify3D which I’m using, will relocate the print head to the right location after resuming printing. It is critically important that you ensure that your nut is level to or below the surface of the top of your print when you pause and insert the nut. 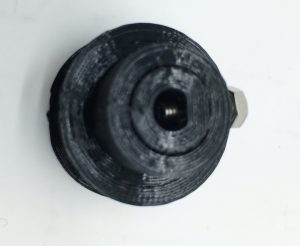 If the nut protrudes above the surface, it may damage your print nozzle. Creating this cavity for a M3 nut and screw is really easy using tinkercad.com. I modified this 36 tooth GT2 gear from thingiverse.com and you can see my final work on tinkercad.com. Check out my object in tinkercad.com and ungroup it to see the objects used to create the cavity and holes. I recently posted about a small tweak to the Simply3D starting script for Printrbots to allow it to home the machine properly at the beginning of a print. I just upgraded to Simplify3D version 3.0.1 from version 2.2.2. I was reminded that there is no GCode to turn off the fan when a print completes. Sometime I print overnight and want to make sure the fan does not run unnecessarily for hours after a print completes. Initially, I print a lot while tethered to my Printrbot Plus Metal because it allowed me to prime the extruder with plastic prior to printing to make sure my print started properly and also provided a lot of feedback, for example, how much time is left to print a model. And it allowed me to manually home my machine prior to printing by clicking home all. Although for years I’ve sliced and printing using Repetier/Slic3r and Cura, more recently I have been slicing and printing using Simplify3D. I like Simplify3D because it slices better (better final printed piece) and also allows for precise placement (addition/deletion) of support. Although it is possible to use Cura to slice in OctoPrint, I don’t. I do all my slicing with Simplify3D and save/export the toolpath GCode to a micro SD card to print via an SD card or upload to OctoPrint’s website if printing via OctoPrint. One thing that has been annoying me is that my Printrbot Plus Metal (with the auto Z height probe) is not setting the Z axis properly before it prints using Simplify3D. 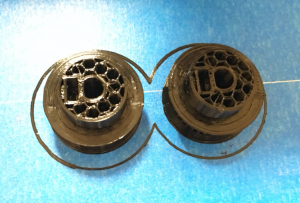 The issue is that the Z axis is left about 1″ above the bed, which is way too high, and that is the z height where it starts printing, which is obviously makes every print fail. However, the Z height is being set properly when I print with Cura. So, up until recently, when I use Simplify3D, I have to manually home the machine (by clicking home all from Simplify3D’s Machine Control Panel). If I’m printing while tethered, it is not a big deal to manually home the machine by clicking one button, but if I want to print untethered, it is inconvenient to have to plug in the USB cable and connect to the printer just to home the machine prior to printing untethered. And if a print fails while printing untethered, I have to connect again to the printer to home it before restarting a new print. I found that I needed to insert one new line (line 2 below: “G28 Z0”). NOTE: this only works for printers where the Z height is set in the firmware or where a functioning Z probe is installed and configured. Line 1 tells the printer to move along the X and Y axis until the end stops are triggered on each axis. Line 2 (this is the new line) tells the printer to move the Z axis until it’s end stop is triggered, which in my case for the Printrbot printers will be when the sensor senses the metal bed. Line 3 initiates the process to auto level by checking 3 points on the bed. I updated my “Starting G-Code” script in Simplify3D to add the second line. Now, the GCode created from Simplify3D always has the correct codes to home the machine properly. So whether printing tethered or untethered, I don’t need to manually home the machine. One last tip, if you are planning to print from an SD card or OctoPrint, it is a good idea to include a skirt that has enough outlines to get your extruder primed prior to starting your print. For large objects (3+ inches in diameter), 2 outlines may be enough. But for smaller objects, you may want upwards of 4 lines or more to make sure your extruder is laying an even bead of plastic when your piece starts printing.